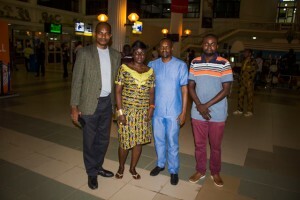 The Founder/CEO Olayinka Fatima Edu and her Director of Projects, Mr. Peter Akpobasah of The Belle of African Nations (BOAN) arrives the smiling coast of Africa to facilitate publicity on BOAN 2015. The Gambia, is one of the participating countries at BOAN 2015 which holds in the first week of December, 2015 at Lagos, Nigeria. Speaking with Afrinity Productions Crew and Victor Nwankpa’s Blog at the Banjul International Airport, The CEO said they are here to meet the people of The Gambia as part of their contestant will be coming from The Gambia in the upcoming BOAN 2015 event in Lagos, Nigeria around first and second week in December. They are also scheduled to meet the Minister of Culture and Tourism. She said, they wrote to the Vice President of The Gambia before coming whom they said accepted their request of visit.